Receive a free SCIENTIST Tee Shirt with purchase! The Oxford Lab Products BenchMate C8 Microcentrifuge enhances the centrifugation process in your lab. The BenchMate C8 Microcentrifuge has proprietary technology making it one of the most user-friendly units on the market. The Electronic Safety Brake immediately stops the centrifugation motion upon the lid opening for superior user safety. The BenchMate C8 Microcentrifuge has a fixed speed of 6,000 rpm / 2,000 x g and a noise level of < 55 dB. It is ideal for all quick spin centrifugation applications. The Benchmate C8 Microcentrifuge enhances scientists research with user-friendly features, safety-oriented technology and a robust design. The microcentrifuge has a unique closed rotor for quiet operation, carbon dust insulation and a safety drain for easy liquid drainage. 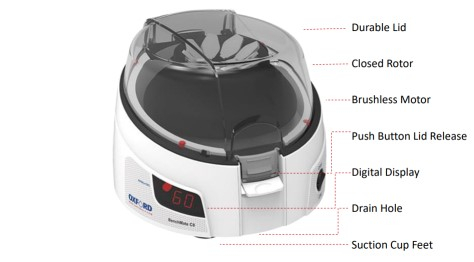 The combination of all of these features makes this unit one of the most advanced microcentrifuges on the market. If you require a centrifuge unit with a higher capacity and maximum speed, the BenchMate C12V Centrifuge is a good option. Closed rotor ensures better airflow and greater efficiency with quiet operation and low heat generation. This also helps to ensure stability for temperature sensitive sample. Speed Accuracy +/- 100 RPM. The small footprint saves valuable benchtop space. The unit is suitable for use in hoods and cold rooms. Carbon dust insulation and safe drainage provisions incorporated into the design. Designed for Quick Spin Applications – Versatility, simplicity, and safety in a single unit. Simple Cleaning – Easy-to-clean drain in case of sample spillage. Rotor and Tube Versatility – 8-place 1.5 mL/2.0 mL microtube rotor and 16-place PCR tube rotor included. Simple Operation and Fixed Speed – Digital display with 6,000 rpm (2,000 x g) fixed speed. Lifetime Warranty in the continental USA – Durable equipment built to last. The Oxford Lab Products BenchMate MS1 and MS4 Magnetic Stirrer units simplify stirring for a variety of laboratory applications. With a slim profile, compact design and no moving parts this magnetic stirrer design is truly maintenance free. The unique Pulse mode of these units reverses the stirring direction every 30 seconds to enhance mixing for difficult to dissolve or mix solutions. These BenchMate MS1 and MS4 Magnetic Stirrer units have no moving parts, therefore there are no parts to wear out due to friction. The adjustable speed range of these units depends on the model. The MS1 speed range is from 15 rpm to 1,500 rpm and the MS4 speed range is from 15 rpm to 1,200 rpm. The corrosion resistant stainless steel top surface fights any damage or corrosion from harsh chemicals. Motorless unit with a very slim profile. No moving parts – truly maintenance free. Adjustable speed from 15 rpm to 1500 rpm in steps of 50 rpm. Timer range 1- 99 mins, and infinite mode. A stirring capacity of up to 800 mL. IP 65 compliant design (water spill resistant). Flat surface – easy to wipe and clean. Supplied with high strength PTFE magnetic bar (25 x 8 mm). Pulse mode – reverses the stirring direction every 30 secs for more intense mixing when needed. The Oxford Lab Products BenchMate VM-M Mini Vortex Mixer enables scientists to perform powerful vortexing anywhere in the lab. With a 100 x 100 mm footprint and a 4,500 rpm max speed, the BenchMate VM-M Mini Vortex Mixer is one of the most powerful mini vortexers on the market. The robust construction with a die-cast aluminum base ensures durability of the product and a long product lifespan. The suction cups add stability to the unit. These cups also reducing the minimal sound and vibration for extremely quiet operation. This BenchMate VM-M Mini Vortex Mixer has a speed range from 2500 to 4500 rpm for thorough mixing & quick vortexing applications. The vortexing orbital diameter is 4.5 mm for optimal vortexing of solutions in common lab vessels. This mini vortex mixer can be used inside fume hoods and in cold rooms, for added versatility. The unit weighs 0.55 Kg. The smart and robust design includes press activation of the vortexing action with a suspension system. The unit delivers set speed, even under varying load conditions, using microprocessor technology. The BenchMate VM-M Mini Vortex Mixer is equipped with a silicon cup that is easy to clean for added convenience. The brushless DC motor provides a more robust and powerful performance. If you require something a little more heavy duty and versatile, check out our larger BenchMate Digital Vortex Mixer. Speed range from 2500 to 4500 rpm for thorough mixing & quick vortexing applications. Orbital vortexing diameter of 4.5 mm. Robust construction with die-cast aluminum base and suction cups for added stability. Can be used inside fume hoods and in cold rooms. 100 mm x 100 mm footprint. 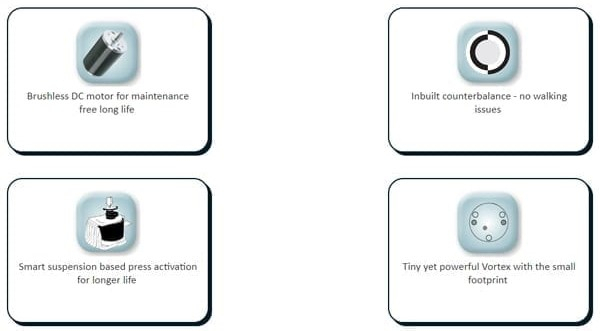 Smart and robust design – press activation with suspension. Silicon cup that is easy to clean. The brushless DC motor provides a more robust and powerful performance. Delivers set speed, even under varying load conditions, using microprocessor technology.